The US and UK governments have indicated there will be no softening of their stances on Iran and Syria despite calls for their help to stabilise Iraq. 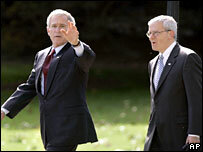 President Bush said Iran must halt its nuclear activities and Syria stay out of Lebanon before talks could begin. UK Prime Minister Tony Blair urged Tehran to "stop supporting terrorism" in the region or face isolation. Engaging Iraq's neighbours is one of the proposals being considered as part of a re-think of US strategy in Iraq. In a major foreign policy speech in London, Mr Blair put the blame for the violence in Iraq squarely on outside forces. It was therefore important to have a strategy for the whole Middle East region which could include co-operation with Iran and Syria, but only if the two countries changed their ways, he said. He accused Tehran of exploiting "pressure points in the region" - Iraq, Lebanon and the Palestinians - to thwart international efforts to rein in its nuclear programme. "We offer Iran a clear strategic choice. They help the Middle East peace process, not hinder it. They stop supporting terrorism in Lebanon or Iraq. They abide by, not flout, their international obligations. "In that case, a new partnership is possible. Or alternatively, they face the consequence of not doing so: isolation," Mr Blair said. Mr Blair is due to speak to the Iraq Study Group, an expert panel asked by the US Congress to re-evaluate American strategy in Iraq, via video link on Tuesday. President Bush met the members of the group, which is due to deliver its final report in a few weeks' time, earlier on Monday. 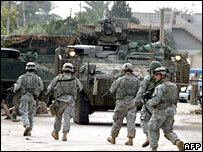 The options reportedly being considered by the group, led by ex-Secretary of State James Baker, are a phased withdrawal of US troops from Iraq, and opening a dialogue with Iran and Syria. The BBC's Justin Webb in Washington says that given the White House's battering in the US mid-term elections, the administration is in more receptive mood but there are limits to what the president is prepared to accept. Mr Bush, answering questions after talks with Israeli Prime Minister Ehud Olmert, made it clear there would be no about-turn in US foreign policy. "Our focus of this administration is to convince the Iranians to give up their nuclear weapons ambitions... An Iran with a nuclear weapon would be a destabilising influence," Mr Bush said. Iran must be isolated internationally if it continued with its uranium enrichment programme, Mr Bush said. The US and other Western countries suspect Iran is trying to build a nuclear bomb - but Tehran says its atomic programme is designed to meet its energy needs. Mr Bush also showed little enthusiasm to engage with Syria, stressing that the US had already made it clear to Damascus that it should stop interfering in Lebanon and stop harbouring extremists. Syrian officials have been implicated by a UN investigation into the murder of former Lebanese Prime Minister Rafik Hariri last year, but Damascus denies involvement. Mr Bush also said in response to a reporter's question that US troop withdrawals from Iraq would have to hinge on the situation on the ground. The Syrian ambassador to Washington, Imad Moustapha, has said his government would be glad to play a role in Iraq - as long as the Iraqis themselves wanted it. "We are willing to engage and we can help - I'm not claiming we have the magical wand - we can help play a constructive role. We have played a constructive role in the past," Mr Moustapha told the BBC. 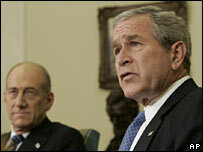 But he said the US first had to accept its policy in Iraq had failed. More than 2,800 US troops have died in Iraq since the US-led invasion in 2003. The UN estimates that as many as 100 people a day are being killed in Iraq in a wave of sectarian violence.